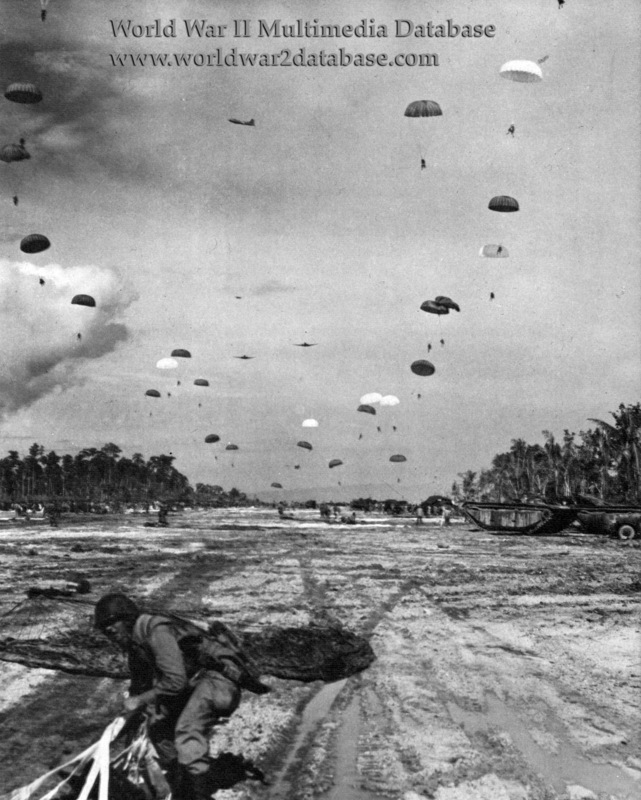 American paratroopers of the 1st Battalion, 503rd Parachute Infantry Regiment land on Kamiri Airdrome on July 3, 1944. A B-17 overhead drops supplies to the paratroopers. The 503rd was sent to reinforce the American landing on Noemfoor by the 158th Regimental Combat Team on July 2. Coming in a day after the initial landing, the 54th Troop Carrier Wing of the 5th Air Force dropped 739 men directly over the airfield. An updated order for the Douglas C-47 Dakota transports to fly single file was not received; the first ten C-47s approached at 175-400 feet (53-122 meters), too low for safe jumping, and 72 casualties, including 31 severe fractures, resulted from the dispersal that dropped some men on top of LVTs, DUKWs, bulldozers, tree stumps, trees, antiaircraft guns, supply dumps, and wrecked Japanese planes. Private Chester W. Nycum later wrote, "Looking to see if there was any Japanese around I was surprised to see a group of our men near the head of the runway playing baseball. My thought at that moment was 'what the hell kind of a war is this?'" The 3rd Battalion dropped on Kamiri on July 4. Even with the C-47s dropping from above 400 feet (122 meters), the hard-packed coral surface of the airstrip caused 56 injuries. In the two-day drop 1,424 officers and men landed; 128 were injured on landing; 59 seriously. The 2nd Battalion arrived on Noemfoor via Infantry Landing Craft (LCIs). Fighting on Noemfoor was initially heavy, but a Japanese suicide charge on July 5 broke the back of their resistance. While airfields were expanded and new ones constructed, the Americans eliminated the last Japanese resistance and declared the island secure on August 31. American casualties were 63 killed, 343 wounded, and 3 missing. 186 Japanese were captured and 1,730 were missing. Out of the 3,000 Javanese brought as slave labor to build the airfield by hand, only 403 were alive by the time they were liberated. 550 out of 900 Formosans (Taiwanese) surrendered to Allied Forces. A single Chinese and a single Korean were captured. Only twenty slave laborers had been killed during the pre-invasion bombardment; the rest died of starvation. Low on food, the Japanese cannibalized their own dead, killed slave laborers, and ate American dead unrecovered overnight.